RIO DE JANEIRO, BRAZIL – According to the final list distributed by Rio’s tourism agency Riotur, 456 blocos have obtained the authorization to parade on the streets of the city before, during and even a little after Carnival in 2015. The first official bloco already fires up the drums this Saturday, January 17th. The bloco Me Beija Que Eu Sou Cineasta parading in 2014, photo by Raphael Dias/Riotur. The registered blocos have filed for a total of 587 parades, which will all take place between January 17th and February 22nd (the Sunday after Carnival). Last year, 457 blocos had been registered with a total of around seven hundred parades. A list of all blocos with location, schedule and expected attendance can be found at the bottom of the page here. 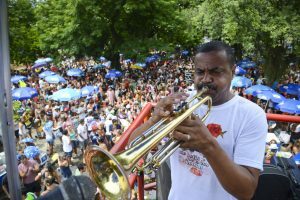 The first official parade will be the one of the bloco “Eles que digam” in Centro’s neighborhood Santo Cristo. It takes place this Saturday, January 17th and starts in the Travessa São Diego at 4PM. Around 1,000 people are expected to attend. The Zona Sul (South Zone) will receive the majority of all blocos with a total of 141. As new blocos aren’t allowed to register in Zona Sul since 2012, the number is down from 148 in 2013. Another 94 blocos will take the streets of Centro, while the Zona Norte (North Zone) receives 58, Barra/Jacarepaguá 36, Ilha Governador 27 and Zona Oeste (West Zone) will have 22. Contrary to first statements, the blocos in Centro which used to parade down Avenida Rio Branco will not all divert to the same route on Avenida Presidente Antonio Carlos. Only the biggest bloco Cordão da Bola Preta, with attendance of over 1 million people, will take that route. The other Rio Branco blocos, such as Bloco da Preta and Monobloco have received an adjusted route down Avenida Presidente Vargas. They will both start around the corner with Rua Tomé de Souza.